There’s a hoedown at Farmer Jeb’s farm, and you’re invited! Click here to play! Party the night away with Jeb and his animals and you’re sure to leave with a few fabulous party favors! You’ll need to get to the barn in order to start the party. The rockin’ red barn is a scatter and will multiply your total bet if you can spin two or more anywhere on the board. Once inside, you’ll soon discover that there are plenty of fun guests at this barn dance particularly the party pig. This curly tailed party animal is a substitute. He only appears on selected reels, but he will replace most other symbols to help you create more winning combinations. He will also trigger a bonus feature if you can spin him on reels 2 and 4 at the same time. Share a dance or two with Farmer Jeb as he pays out a massive 4000 times your line bet if you can spin five of him across an active payline. There are also chickens, tractors, and, of course, moonshine to ensure that you have a great time at this rural party! Rock all through the night with Farmer Jeb and his party animals and you’ll certainly pick up some pretty great cash prizes! The big, red barn acts as a scatter. Spin two or more anywhere on the board to multiply your total bet by 2, 5, 20, or 200 respectively. The party pig acts as a substitute. He only appears on reels 2 and 4, but he will substitute for all other symbols (excluding scatters) to help you bring in more wins. 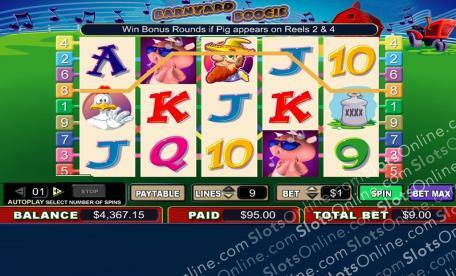 If you can spin the party pig on reels 2 and 4 at the same time you will trigger a bonus feature. Once the game is activated, you'll find yourself inside the bard with a selection of objects in front of you. Pick the different objects to reveal the dancing pigs. You'll get three attempts and you could win up to 1000 times your triggering bet!